Hello, cold weather! The temperature finally dropped and it’s chilly in Raleigh. Daytime temps are between 45-55, and since Daylight Savings ended it’s dark and cold! Over the past few years, I’ve struggled to find a well-fit sweater that is warm. This past weekend I challenged myself to find the perfect sweater. On Sunday, I went to the local mall and hit all my favorite stores…and tried a few outliers. I’ve linked all of the sweaters below. Gap’s Raglan Cable-Knit Pullover Sweater. This sweater was a little too chunky for my taste. I’d probably have to go up a size and worry about it shrinking in the wash.
Gap’s Merino Wool Turtleneck. I’m not one for turtlenecks, but I love Gap’s merino wool. It’s lightweight but warm! I loved that the sleeves were a little long and the sweater itself was formfitting. Gap’s Brooklyn V-neck Raglan Sweater. I liked the lightweight material, but not a fan of wearing v-necks in the winter. Gap’s Sherpa Sleep Turtleneck. I went out on a limb and tried on this sweatshirt/turtleneck. I would never wear it in public, but it was SO comfortable…and very warm! Gap’s Softspun Raglan Tunic. I don’t think this is considered a sweater…but I love this so much I bought 2! It felt like a lightweight sweater crossed with a lounge shirt. I might go back and buy one in every color! Perfect for layering! Gap’s Softspun Boatneck Pocket Tee. Similar material as the tunic above. Very comfortable, but I didn’t like the 3/4 sleeve. Loft’s Flecked Kimono Cardigan. I went back and forth on this one. I like the idea of a wrap cardigan, but every wrap I’ve owned in the past I’ve never liked. I decided this was a no-go. Loft’s Ribbed Shawl Open Cardigan. I liked the weight and material of this cardigan, but I’m not looking for another cardigan. In colder months I’d prefer to keep my clothing closed. Loft’s Cable Shoulder Sweater. The knitting on this shirt was really loose. I felt like there were a lot of open holes, which I didn’t feel like would keep me warm. Loft’s Lou & Grey Washed Boucle Sweater. I loved the material of this sweater, but it was really wide and the side slit came up really high. It looks like the sweater was made for layering and lounging. Loft’s Boatneck Tunic Sweater. I loved this sweater! It was the perfect “heaviness” to keep me warm and it fits great. I love the tunic length…great for pairing with leggings! Loft’s Textured Bell Sleeve Sweater. I really loved the body of this sweater but not the bell sleeves. The fabric was warm and soft. The length and fit were perfect…but again, I couldn’t get myself past the bell sleeves. Aerie’s Boucle Oversized Sweater. I liked the fabric and weight of the sweater but wasn’t feeling the balloon/bell sleeves. While I liked the material of the sweater, the turtleneck wasn’t very comfortable. Aerie’s Oversized Quarter Zip. Compared to the Sherpa Pullover at Gap, I loved this sweater! I had to tuck under the bottom ribbing because it was so long, but it was so comfortable. I didn’t buy this since it isn’t something I’d wear to work. Definitely adding it to my Christmas list!! Banana Republic’s Eyelash Open Cardigan. I retract my last statement. THIS is the coziest thing I’ve ever worn! I instantly wanted to curl up and take a nap. I didn’t want to take it off! However, at $150…I couldn’t justify the purchase. THIS is on my Christmas list! Any takers?? Banana Republic’s Machine Washable Merino Scalloped Crew. This was the perfect lightweight sweater! I loved the scallop details around the neck. BR has a bunch of these sweaters in a variety of styles (here and here). Banana Republic’s Italian Supersoft Classic Crew. I really liked this sweater, too. It was warm and soft, and the fit was perfect! So, which sweater is perfect? 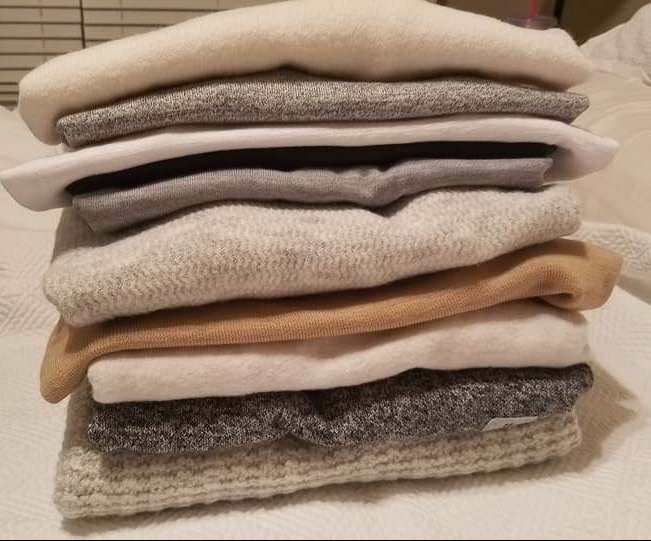 I actually found several “perfect” sweaters. Probably too many! I’ll have to try on my favorites again and narrow them down. I also want to swing by Target and Old Navy — two of my go-to clothing stores. Hopefully, I can find some of these cheaper (because let’s be honest….Banana Republic alone blew my budget)! If you’re looking for the perfect sweater, I hope my post provided some guidance! If you have any store/style recommendations, please let me know.